Subtitled: When Will The Madness End? So looking at the corner where the lumber and supply companies are reminded me that Chris and I still hadn't gotten around to finishing the connection from the helix backdrop to the main layout backdrop. This has been a project that has been lingering simply because the back drop appears to need to be connected together in a place where it's quite a reach, and not really going to be that easy to do. 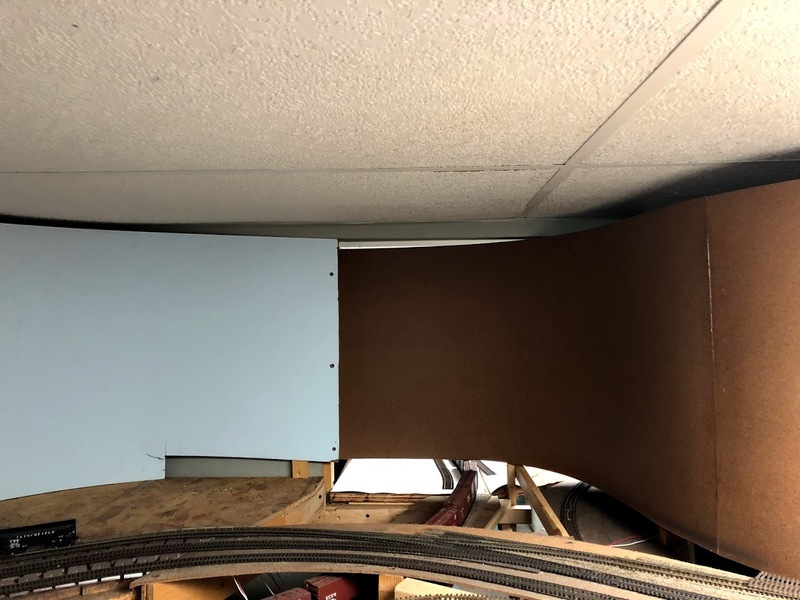 So I looked at it again, and "All I need to do is get the helix backdrop behind the other backdrop" and the tension between the two will help set the location, then we can figure out how to attach the two together. So can I do that? Working from inside the helix, with some work it seemed like I should be able to do so. Getting it all the way behind the other one put quite a lot of tension on it, and then...it not only popped behind it, but all the way around that corner and lodged it's place into position. It completely changed the equation. It totally opens up the corner. 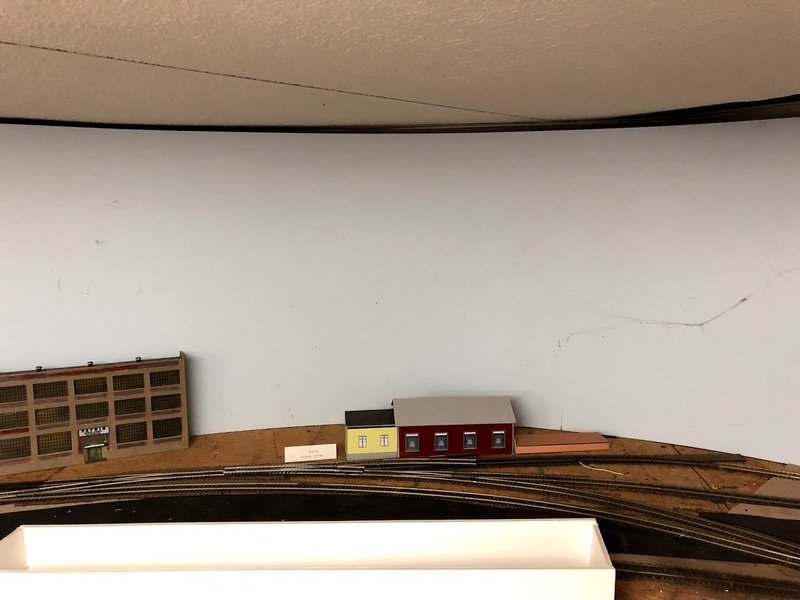 So much so, that I can add another missing siding, for P.F Corbin. you can see an upside down turnout on the right corner that I placed where it would go (I didn't have an extra right-hand turnout). But wait, there's more! 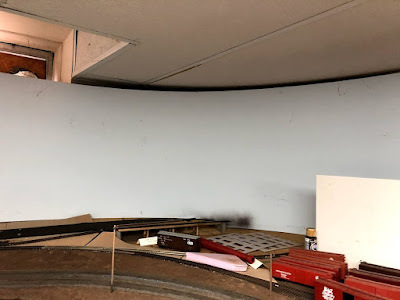 "All I have to do is pull in the masonite across that side of the helix some more," then I can add at least one more industry to the layout. And it's one that receives reefers which is kind of neat. This is going to take a bit more work, because I'll have to cut out that portion of the frame that's holding the backdrop up. In addition, the turnout will be a curved turnout on the inside of a 24" radius curve. So once I've got that together, I'll look at doing the backdrop. It's conceivable that I might be able to add a second industry here, but it's a turnout facing the other direction, with the track crossing the first. I'm not sure I can build that inside a 24" radius curve, and I'm not sure I really have enough real estate to fit it. But could I do similar things to include other missing industries? Well, on the other side of the helix I could fit one additional one by cutting the corner where the Berlin Line and helix benchwork connect. That one's pretty easy because there's almost room for the siding already. "All I need to do is make enough room to model the coal dealer." I've just found a way to add three missing industries to the layout, without crowding them in (it will actually improve the appearance as you come around the helix).What about the other corners? In this corner there's also been quite a bit of compromise. The track that curves off to the right next to the backdrop goes into the Corbin Screw building. There should be a second siding to that small freight house mock-up, which is part of the Fafnir Bearing property. 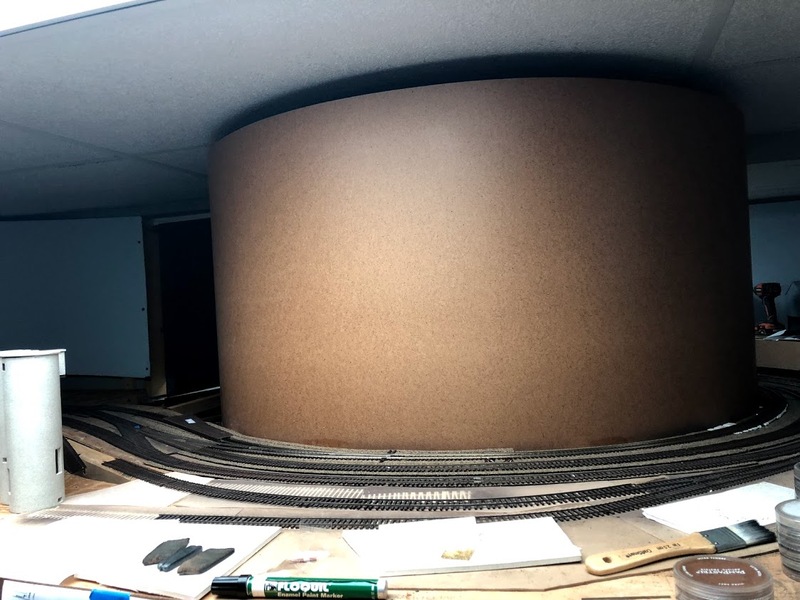 "All I need to do is push the backdrop back into the corner more" and I should be able to add that second track, and still have room to spot 3 cars on it. The short siding in front of the Corbin track receives tank cars for Fafnir, and would move slightly to the right. I've mocked up an (extra) set of the Micro Engineering Yard System turnouts, and it fits well. This doesn't add an industry, but it does correct the operation a bit. So yes, I've just added a bunch of work that will ultimately improve (greatly in my opinion) the scenic element of the layout. As a bonus, I can add from 1 to 5 additional sidings that are currently missing, depending on which projects I choose to do. Right now I'm planning on 4 of them. By the time I finish building the layout, I'll know how to do it.